The book is in electronic form and is available on the DBEDT website at: dbedt.hawaii.gov/economic/databook and may be downloaded in whole or in part as either PDF or Excel files. 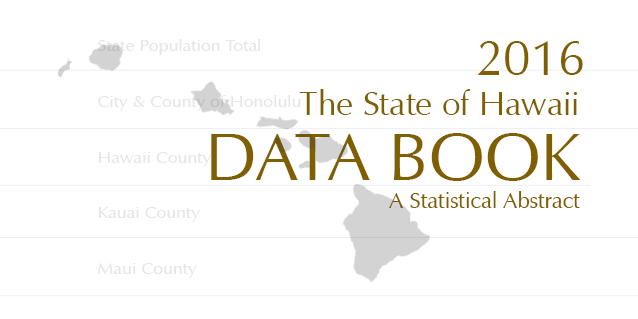 The state’s Data Book is the most comprehensive statistical book about Hawaii in a single compilation. With more than 800 data tables, classified into 24 sections, it covers a broad range of statistical information in areas such as population, education, environment, economics, energy, business enterprises, government, tourism and transportation. DBEDT’s Research and Economic Analysis Division (READ) also maintains the historical series of tables and updates the data continuously throughout the year. The historical series and the update can also be found on the DBEDT website at dbedt.hawaii.gov/economic/databook.